For countless Christians throughout the world, today records the first day of the Paschal Triduum. This evening, the Church celebrates the Mass of the Lord's Supper. It is at this Mass Jesus, in fellowship with the 12, celebrated a Passover meal. That is, they celebrated a meal that looked back to God's saving actions in the Exodus when the Hebrew people were led out of Egypt. It is at this meal, furthermore, that Jesus' actions transformed the meaning of this meal forever: he united the 12 around his own body in blood in what we continue to celebrate in the Eucharist. For Christians, the Eucharist is meant to be the Sacrament of unity. Now, bear in mind that it's not as though a group of well-intentioned people, led by a priest, get together and somehow conjure the Risen Christ down into what looks like common bread and cheap wine. The Church doesn't make the Eucharist as Hostess makes Twinkies. Instead, it is the Eucharist that makes the Church: the Risen Jesus continues to gather a people around himself, continues to nourish them, and continues to send them on a mission into the world. We are as a Church because Jesus calls us together. Hence there is a certain irony that in today's celebration of the sacrament of unity we also realize that, since its very beginning, the Church has had to confront ongoing betrayal. Even as Jesus washed feet and celebrated with the 12, Judas' heart was set: he would betray Jesus. Peter, who enthusiastically swears utter fidelity and solidarity with Jesus, will also fail. Those who tonight eat and drink with Jesus will, in just a few short hours, scatter from him as he faces execution. To a critical eye, it would seem as though the fellowship of the Eucharist was doomed to failure from its inception. Two thousand years later, those who continue to be gathered by the Eucharist continue this pattern of betrayal established so many years ago: the very sacrament that promises to unite us as a people often becomes most divisive. In an especially public manner these last ten years, the Church has looked like an awful failure. Failures of leadership, of transparency, of courage...these are failures that have betrayed the unity offered by Jesus. Make no mistake: the failure goes all the way down. Just as I am dismayed by the sometimes ostentatious behavior of Church leadership, I'm equally saddened by the finger-pointing of those who chastise bishops while not admitting of their own hypocrisies. 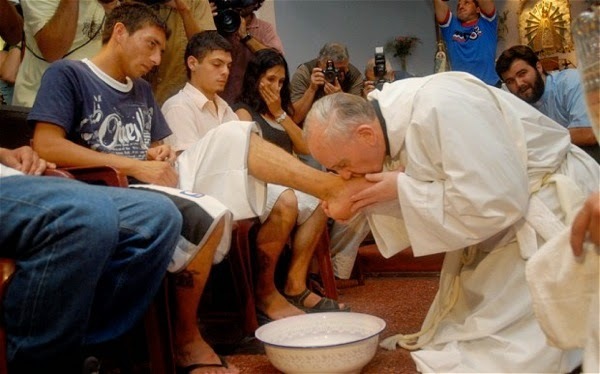 It's easy to decry lavish spending and say, "Look at the Pope! You need to live more simply!!" It's another thing to look at oneself and say, "I, too, am called to live simply so that others may simply live." Self-important clerics and self-righteous Catholics are equally tiresome. We are, all of us, sinners. Since its inception, the gift of Church unity has been threatened by human frailty and sinfulness. Yet the Church remains...in spite of the best efforts of some of its faithful! As we celebrate tonight the institution of the Eucharist, we might do well to consider how each one of us is "an invited betrayer." As sinners all, none of us is exempt from inflicting wounds on the unity of Christ's Body. Yet our invitation to communion is an ongoing summons to conversion and healing, to trying again, to allowing ourselves to be caught up in the life of discipleship promised by Jesus.